THIS IS THE FINISHED PRODUCT OF OVER PAINTING THIS MAGNIFICENT PAINTING FOR A " FATHER'S DAY PROGRAM " ! 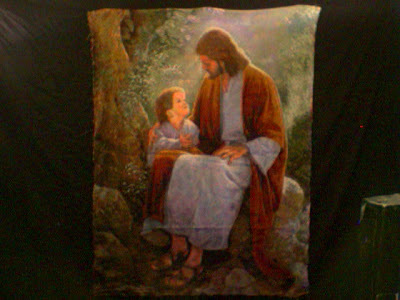 I OVER PAINTED THIS PICTURE WITH FLOURSCENT PAINT, FLOURSCENT CHALK, FLOURSCENT CRAYONS. AND THEN PUT A BLACK LIGHT ON IT. 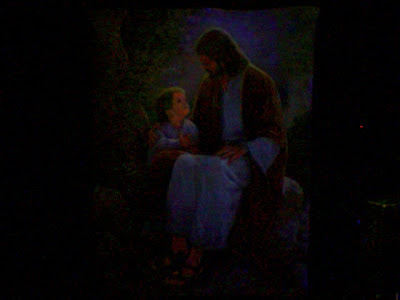 THIS IS THE ORGINAL PAINTING WITH A WHITE LIGHT. IT MAKES A DRAMATIC CHANGE WITH THE BLACK LIGHT EFFECT. BESIDE THIS PICTURE IS WHERE I WOULD PUT THE FATHER'S DAY LESSON OUTLINE.